Eyegrade uses a webcam to grade multiple choice question exams. Needing just a cheap low-end webcam, it aims to be a low-cost and portable alternative to other solutions based on scanners. The latest available version is Eyegrade 0.8.1, which was released on March 29, 2019. [Mar 29, 2019] Eyegrade 0.8.1 has been released! See the blog post or go to the downloads page. [Jan 25, 2018] A user from Vietnam has contributed with a nice video tutorial. It's linked from the documentation page. See the blog post. [Jul 26, 2017] Eyegrade 0.7 has been released! See the blog post or go to the downloads page. 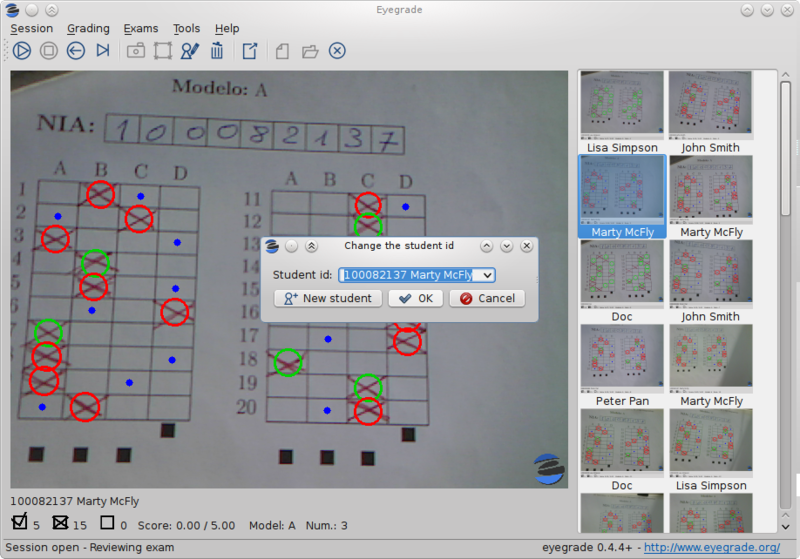 Grading the exams: By using a webcam, the graphical user interface of Eyegrade allows you to grade your exams. Eyegrade is able to recognize not only the answers to the questions, but also the identity of the student by using its hand-written digit recognition module. The whole process is supervised by the user in order to detect and fix potential detection errors. Exporting grades: Grades can be exported in CSV format, compatible with other programs such as spreadsheets. Typesetting the exams: Although you can create your exams with other tools, Eyegrade integrates an utility to creating MCQ exams. It is able to create your exams in PDF format. Eyegrade can automatically build several versions of the exam by shuffling questions and the choices within the questions. Eyegrade has been used in several courses at Universidad Carlos III de Madrid since 2010, as well as in other institutions worldwide. Follow the quick start guide if you want to give it a try. Eyegrade is free software, licensed under the terms of the GNU General Public License (GPL) version 3 or any later version. The source code of Eyegrade is hosted at Github: jfisteus/eyegrade. Bug reports, feature requests and pull requests are welcome there. How can you cite this work from academic papers? Please, cite the paper if you use Eyegrade for research activities.